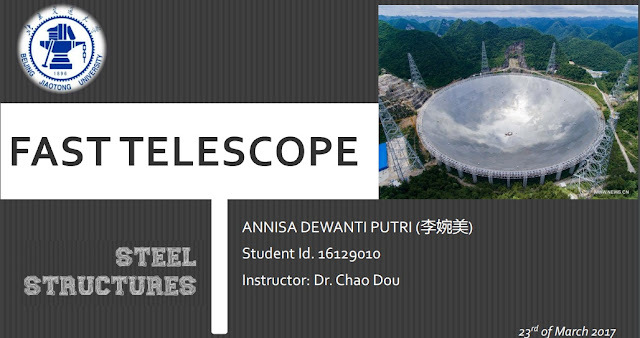 Five-hundred-meter Aperture Spherical radio Telescope (FAST) is a Chinese mega-science project which is said the largest single radio telescope in the world. Its innovative engineering design has create a new road to implement a huge single dish in the most effective way. Fast Construction will have impactful functions in Aerospace for example, surveying the neutral hydrogen in the Milky Way and other galaxies, detecting faint pulsars, Search of the first shining stars, search for the possible signals from other outer space, etc. The Large Telescope (LT), referred to as the Square Kilometer Array (SKA) nowadays, was proposed by astronomers from 10 countries including China at the General Assembly of the International Union of Radio Science (URSI) in 1993. FAST, which is to be built in a karst depression in Guizhou province of southwest China, is the Chinese engineering concept proposed and extensively investigated since 1994 for realizing the SKA units.